Among a slew of new brews, old favorites still stand out. With a plethora of new breweries popping up, it's easy to get lost in the traffic as a steady stream of new beers keeps whizzing by. If you move over into one of the slower lanes on the beer super highway, you'll find an entire off-ramp filled with familiar beers you've turned to in years and months past. Let's take another look at some of these beers you might know all too well, but possibly forgot about. 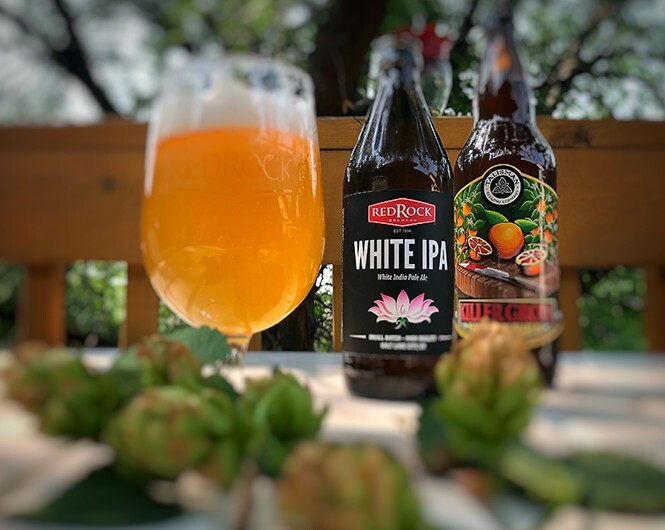 Red Rock White IPA: It pours a hazy, bright golden-yellow color, with one to two fingers of fairly dense white head; head retention is good, but eventually reduces to a small cap that lingers. Light spotty, soapy lacing clings on the sides of the glass. The aroma is comprised mostly of lemon zest, grapefruit, tangerine, coriander, pepper, clove and yeast earthiness—pleasant aromas with good balance and complexity of fruity/spicy yeast and other spices. The taste starts off with lemon zest, grapefruit, tangerine and mango. From mid palate you get wheat, cracker, light banana and herbal grass to counter the initial hop fruitiness. As you reach the end, you're greeted with pear and more earthy yeast notes. The finish is long with fruity citrus hops and pale malt flavors, with a great malt/bitter/spiciness balance and zero cloying flavors. The body is medium to light with a very smooth, fairly creamy/sticky mouth feel that's satisfying. The 4 percent alcohol is well hidden with minimal warming present. Overall: This is a very nice White IPA style, with all-around impressive robustness, complexity and balance of fruity/spicy yeast, spices, citrus hops and pale malt flavors—very smooth and easy to drink. You can find it right now at all Harmons locations. Talisman Blood Orange Wheat: When poured, a super hazy orange color emerges, with a one-finger's worth of head of pure white foam. The head fades quickly at first, but then very slowly, leaving a great level of foamy lace on the sides of the glass and a nice film on the top of the brew. The nose is big with a yeasty and orange citrus peel aroma that transitions to notes of lemongrass and herbal perfumes. The taste begins with a good showing of orange and tangerine flavors, along with some tart grapefruit qualities. Accompanying these flavors are notes of a more bready taste with lots of yeast mixed in. As the taste advances, the brew sours up a bit more, with some lemon and more grapefruit coming to the tongue. Along with these flavors comes some grass and herb, leaving an oddly sweet and bitter citrus and hop flavor to linger on the tongue. The finish is semi-dry with cracker and citrusy pith. At 4 percent, the body of this brew is on the average side; in terms of thickness and creaminess, the carbonation level is on the lower side. The body is also enhanced by the yeasty and wheat flavors. Overall: A decent brew with a nice blend of sweet and bitter citrus that plays nicely with sweet and tart citrus, plus just enough grass and bread to balance it out. This beer is best served cold, but if you let it warm a little, the fruitier characters from the yeast make it an entirely different citrusy beast. Both of these beers get a nice enhancement from their individual yeast strain that take them in different directions. I think you'll find these are both great as quenchers and as educational beers. As always, cheers!